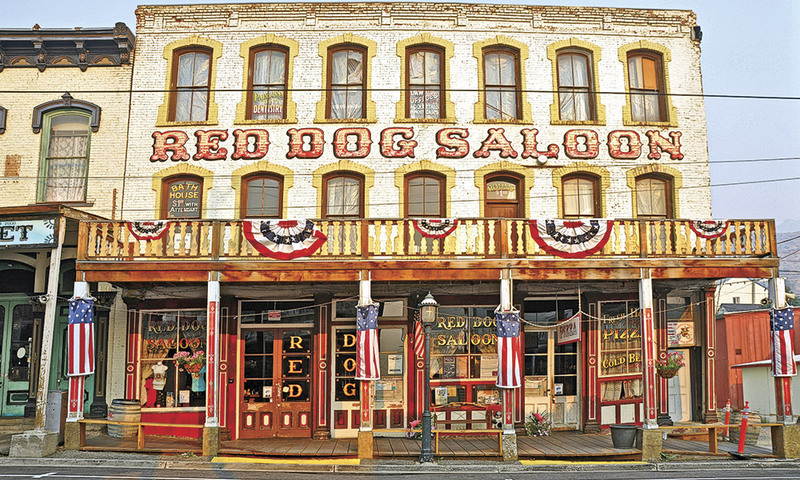 Nevada’s Silver Roots Experience the Old West in an adventurous round trip around the heart of the Silver State. 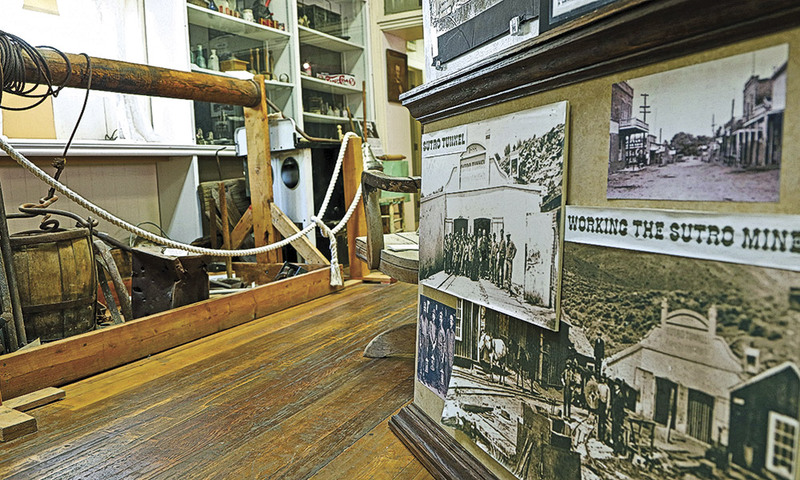 Henry Comstock — whose 1863 Comstock House in Virginia City, is now the Red Dog Saloon — was always in search of the latest technology to reach the rich veins of ore deep under the Nevada desert. In 1868, Comstock was one of the first to use the new invention by Swedish chemical engineer Alfred Nobel —dynamite. 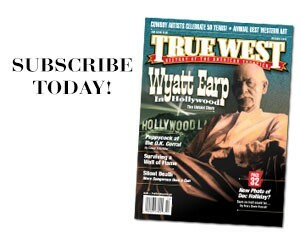 What do San Francisco real estate, George Hearst, Mark Twain, the Civil War and the Nobel Peace Prize have in common? The answer: Nevada’s famous Comstock Lode. In July 1859, a weary traveler strode into Grass Valley, California. He had trudged more than 150 miles over the massive Sierra Nevada from the Washoe County in western Utah territory. He was carrying some odd-looking chunks of gold-bearing ore. He took them to local assayer Melville Atwood to have them tested. What Atwood discovered made him doubt his own calculations. Besides the gold content, which ran about $1,000 to the ton, the specimen contained a much higher value in silver—over $3,000 a ton. Irishmen Patrick McLaughlin and Peter O’Reilly were the first to discover the rich lode, but they didn’t realize their find included silver deposits. They were washing out the gold with their rockers, letting the rest of the rock roll away. That rock was picked up by mountain men and itinerant miners in the area. One of those prospectors was Henry Comstock, who was in the vicinity when McLaughlin and O’Reilly were working the find. Comstock immediately declared the spot his and insisted he had already filed a claim for the location. The miners didn’t pay much attention to him and continued on with their job. Comstock left to find help and returned the next day with Manny Penrod. Penrod claimed to own the spring McLaughlin and O’Reilly were sifting through and cheerfully backed up Comstock’s story. The Irishmen reasoned there was enough gold to go around, decided not to fight the matter, and agreed to give Comstock and Penrod equal shares in the discovery. The Dayton Museum honors the mining history of the city and region, including an exhibit on Adolph Sutro and his innovative Sutro Tunnel built in 1878 between Dayton and Virginia City for water drainage and safer mine shaft access. Subsequent mining claims were filed in various points on Sun Mountain where the chunks of silver ore had been collected. Prospector George Hearst, father of William Randolph Hearst, purchased a share in one find on the mountain’s slopes for $3,500. Shortly afterwards, Hearst opened the Ophir Mine, which produced more than $400 million in gold and silver ore. When word of the Comstock Lode got out, thousands hurried to the region to capitalize on the strike. Many who flooded the area were from San Francisco. Much of the money they made in Nevada was taken back to San Francisco and invested in real estate. One of those San Franciscans was Adolph Sutro, who built the famous Sutro Tunnel in Virginia City. The tunnel was built to efficiently drain and ventilate the mines. Virginia City grew up around the mining activity and was made a popular destination by the Comstock Lode. By the spring of 1861, more than 40,000 people lived there. It had theaters, luxurious hotels, utilities and blocks of fine homes. Among the many businesses in Virginia City was a robust newspaper called The Territorial Enterprise. Journalist Samuel Clemens moved to the area in 1862 and began writing for the paper, taking the pen name Mark Twain. In 1851, when Nevada was still a part of the Utah Territory, the trading center of Genoa (originally Mormon Station) was founded to serve California trail emigrants. Genoa had the state’s first hotel and newspaper, and the Genoa Bar is known as the “Nevada’s oldest thirst parlor. In 1863, President Abraham Lincoln needed the Nevada territory silver and pro-Union senatorial votes. The territory was propelled into statehood on October 31, 1864, in the midst of the Civil War. The riches gleaned from Virginia City helped fund the Union’s efforts. Virginia City, and by extension, the state of Nevada, continued to prosper throughout the 1860s. New innovations were being introduced daily in the mining community, including one invented by chemist and engineer Alfred Nobel. In 1866 Nobel developed and patented dynamite. It was first used in the mines around Virginia City in 1868. The explosive brought Nobel fame and fortune. He later established the Nobel Prize Awards. In time, the trails cut by pioneers into the land of silver and gold gave way to modern roads, and following those roads in either direction led to hospitable locations throughout the state where mining wasn’t the main source of industry. In Carson City, for example, the focus was on transportation. Named after mountain man Kit Carson, Carson City originated as a stopover for California-bound emigrants. It was the hub for the Virginia and Truckee Railroad and has served as Nevada’s capitol since statehood. From Carson City, the Virginia and Truckee rails stretched 66 miles to Virginia City, Reno and Minden, Nevada. They served the transportation needs of the Comstock’s inhabitants and paid its early owners handsome dividends. Some of Virginia and Truckee Railroad’s ornate cars are on display at the Nevada State Railroad Museum in Carson City. To feed hungry miners in Nevada’s Comstock Lode towns, cattle ranching came to the territory in the 1850s and 1860s, and the state’s rich buckaroo history began. Founded in 1913, Elko’s Silver Stampede in July is the oldest rodeo in the state. 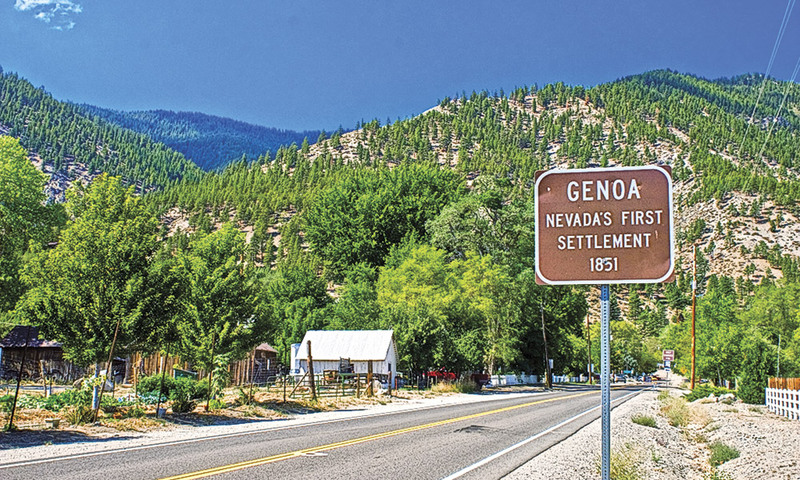 Genoa, the first settlement in what became Nevada Territory, is 22 miles south of Carson City. It was established as a trading post in 1851, and the Overland Emigrant Trail passed through what is now Genoa’s Main Street. 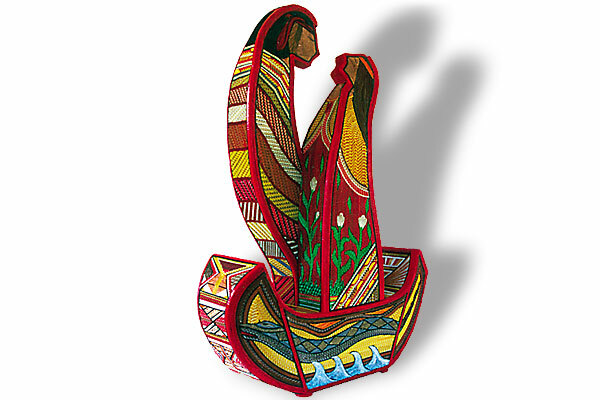 Most of the area’s initial inhabitants were Mormon. In fact, the town was first called Mormon Station. In 1855, the name was changed to Genoa, the Italian city where Christopher Columbus was born. Genoa has a thriving historical community, complete with a courthouse, hotels and saloons. Mark Twain and Teddy Roosevelt patronized the Genoa Bar, the third-oldest bar in the state. The annual Genoa Cowboy Festival held in April celebrates its Western roots with music, poetry, presentations and workshops showcasing the pioneering, Old West cowboy heritage. Northeast of Genoa and Carson City, along picturesque I-80, are colorful deserts, mystic caves, majestic mountain ranges, charming lakes and many hospitable towns and cities like Winnemucca. Nestled in a valley with the Humboldt River running through it, the site has been important to Nevada since the first explorers traversed the region in the late 1820s. 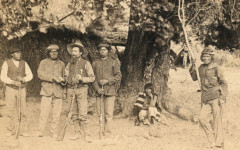 It was a critical rest stop for early settlers, and marked the point at which the immigrant trail headed south toward the Sierra Nevada passes. Named for Old Winnemucca, a respected Paiute leader, the area was deemed a good place for the railway to intersect with stage lines that ran both north and south. Winnemucca became a major distribution point for the Central Pacific Railroad, established itself as the center of commerce in north-central Nevada, and was the site of a major bank robbery that some still dispute was perpetrated by well-known outlaw, Butch Cassidy. Ranching was, and still is, an important part of Winnemucca. In the mid-1870s cowboys rounded up herds of longhorn cattle and loaded them onto railcars to be sold at markets in the east. 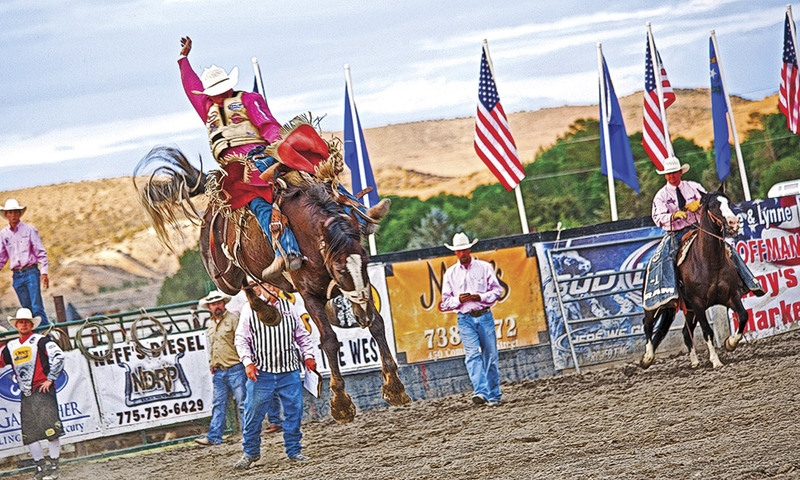 The annual Winnemucca Ranch Hand Rodeo celebrates the history of the cowboys in the area. It is the largest rodeo in Nevada. Further east on I-80 is Elko County, considered one of the last frontiers of the Old West. Founded by the Central Pacific Railroad in 1868, Elko quickly established itself as the central business hub for the area. By February 1869, the budding community supported a rough-and-rowdy population with more than 60 canvas tents. Later that year, Elko was selected as the seat of the county that bears its name. The town grew over time, with shipping, livestock, gaming and mining being central to its economy. Now the remote, once-popular train stop has developed into a cultural attractions destination. The Northern Nevada Railway Museum in Ely, a national historic landmark, along with its historic short-line railroad, offers travelers a living history experience, including being an engineer for the day. Among the many draws to the Elko area today is the Northeastern Nevada Museum. 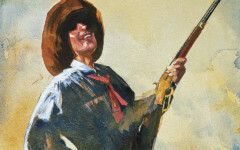 Often referred to as the best museum in the state of Nevada, the 40,000-square-foot facility has a grand collection of local and regional artifacts from early settlers, Western art and photography, and an Old West firearms exhibit. The California National Historical Trail Interpretive Center is another museum of note in Elko. The 16,000-square-foot center features exhibits that tell the stories of the more than 300,000 people who passed through the area on the California Trail between the late 1840s and the 1860s. Elko’s Cowboy Arts and Gear Museum is dedicated to preserving the cowboy, vaquero and buckaroo heritage. The museum houses countless historical relics from the region—most of which are rooted to the very beginning of Nevada’s first rodeo, the Silver State Stampede, the state’s oldest rodeo. The tradition of this rodeo started in 1913 when GS Garcia, the world-famous bit-, spur- and saddle-maker, decided that northern Nevada cowboys needed a rodeo. The Silver State Stampede is held annually in mid-July and features real working cowboys from Nevada and surrounding states. For more than 30 years, the Western Folklife Center in Elko has hosted the Cowboy Poetry Gathering and put a national spotlight on the evolving culture of the West. Cowboy poets from all over the world participate in the annual event that honors the heritage of sheep and cattle ranchers. South of Elko is the town of Eureka. Long before Eureka was established, emigrants and the Pony Express riders were traveling through the area to four express stations in the county on their way to California. Initial mining discoveries in the area were made in 1864, but the impressive production of minerals didn’t happen until 1870. The hamlet’s prosperity lured a flurry of prospectors to the region and Eureka became Nevada’s second-richest mineral producer. Among the most popular businesses in Eureka were the Jackson House Hotel, built in 1877, and the Eureka Opera House, built in 1880. The Jackson House Hotel is still in business and the opera house, which was fully restored in 1993, continues to host performances. The town of Ely, east of Eureka, is situated at the juncture of U.S. Highways 50 and 93. Ely originated as a stagecoach station along the Pony Express and Central Overland Route. Ely remained a relatively small town until 1906 when copper was discovered there and several mines were opened. The Nevada Northern Railway was built shortly thereafter by Mark Requa, the son of a silver mining magnate, to haul ore between mines and to transport the material to smelting facilities. The railway stopped running when the smelting plant was closed in 1983, and the town of Ely now has possession of the train. 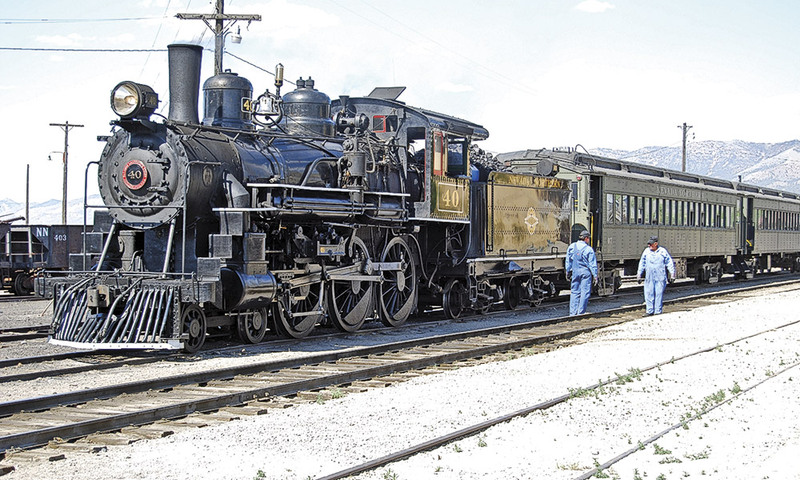 The Nevada Northern Railway, maintained by the staff at the Nevada Northern Railway Museum, is one of the best-preserved short-line railroads in the nation. The 56-acre site has one of the last remaining complete stand-ard gauge railroads in the United States. Nevada’s wealth from the Comstock Lode furnished capital to build railroads, telegraphs, companies, hotels, banks, towns and cities throughout the region. It continues to lead travelers across the state to visit long-forgotten boom-and-bust mining towns and flourishing cities abundant in history. Chris Enss is a New York Times best-selling author with two new books coming out this year: Cowboys, Creatures and Classics: The Story of Republic Studios and The Principles of Posse Management: Lessons from the Old West for Today’s Leaders. Chris Enss is a New York Times bestselling author who has written more than 20 books on the subject of women in the Old West. Lost Photo of Crook’s Scout Discovered? An unseen stereoview by John Campbell Burge opens up the discussion. St. Joseph, MO A #10 True Western Town.